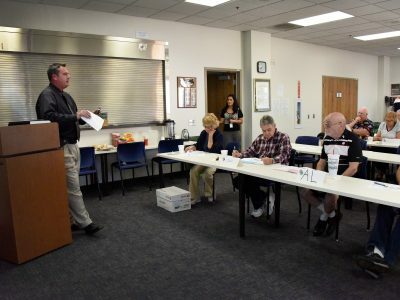 The Sheriff’s Citizen Academy is a twelve-week course designed to give citizens an overview of the police department’s function and operational procedures. There are presentations by a superior court judge, K-9 officer, S.W.A.T. team members, bomb squad technicians, narcotic officers, and many others. Participants will also have the opportunity to meet Command Staff and get a comprehensive tour of a police station. Additionally, there are field trips to the Pre-Trial Detention Facility, Juvenile Justice Center, Sheriff’s Communications Center, Forensic Laboratory (CSI), the Sheriff’s Training Academy, and the Aviation Unit. Participants will be exposed to all aspects of the Ventura County Sheriff’s Office including a ride-along with a patrol deputy. Potential candidates must be at least 21 years of age, live or work in Ventura County, have no felony convictions, and no misdemeanor convictions within one year of applying. There is no cost for attending the academy. You acknowledge that by clicking the Electronic Signature checkbox and selecting the Submit button, you are indicating your intent to sign this form and that this will constitute as your signature.